Man, I’m tired of actresses that I don’t find attractive trying to carry a movie, let alone a comedy! I mean, it’s okay for someone like Will Ferrell to be crude or maybe use his physique for some laughs, but women should keep in mind that it’s just not ladylike. And what about onscreen romances? They really should be believable, like Kevin James and Rosario Dawson, you know? What are those Hollywood elites thinking? Well, Spy is thinking about pointing out what a steaming pile of double standard b.s. that argument is, and being solidly funny while doing it. 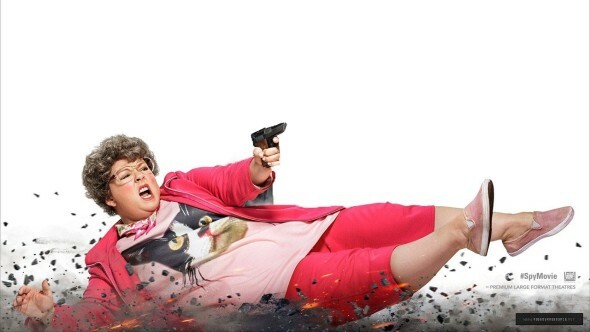 It’s the latest teamup for director Paul Feig and star Melissa McCarthy, who gave us the hilarity of Bridesmaids and its one-for-the-ages character of Megan. Feig also gets writing credit this time, and it’s hard to believe he didn’t craft the script especially for McCarthy. She plays Susan Cooper, a “basement” employee at the CIA who spends most of her time as Girl Friday to super spy Bradley Fine (Jude Law). But when Fine is taken out and the identities of all current field agents are compromised, it’s up to Susan to go under cover across the globe, gain the trust of the villainous Rayna Boyanov (Rose Byrne) and rescue a rogue nuke before it can be sold to terrorists. So yes, it’s a sendup of Bond-type capers, and a good one. Feig delivers surprisingly stable action sequences, and plenty of freedom for his stellar ensemble to create some infectious fun. Byrne continues to show real comic flair, and Jason Statham practically kidnaps the film as Agent Rick Ford, a riotous parody of the to-the-extreme tough guy roles that made him famous. British favorite Miranda Hart also gets big laughs as Nancy, a fellow CIA desk jockey who follows Cooper into the fray and remains pleasantly clueless as to the danger at hand. But this is McCarthy’s show, and a leading role tailor made for her powerhouse talent. As Cooper assumes various identities and becomes more confident in her role as a badass, the film lands some sly shots at the sexist barbs often thrown McCarthy’s way. Bravo. Spy is not only really funny, it’s plenty smart, and just a damn good time.